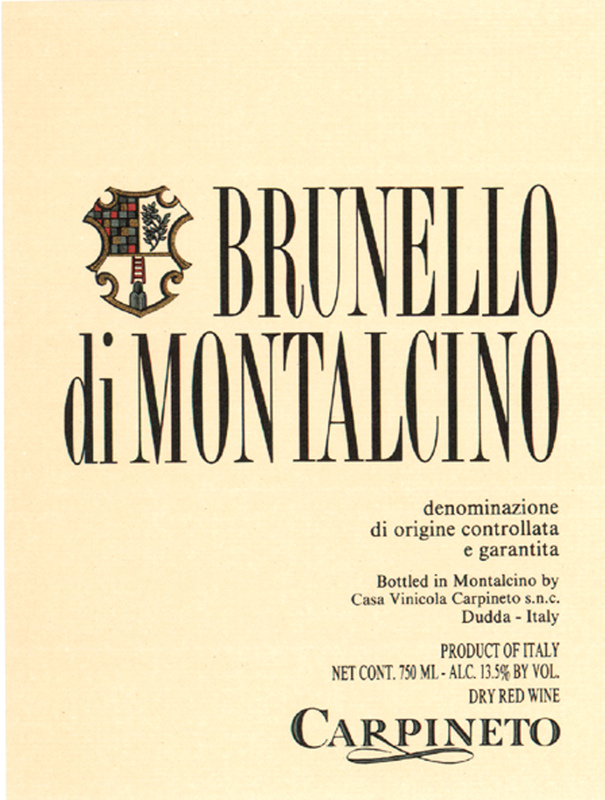 Brunello is a term used by locals to refer to the dark brown color of the grapes at harvest. Carpineto’s single vineyard Brunello di Montalcino possesses a complex bouquet of nuts and spice, accented by hints of vanilla, cherry, and raspberry. Aged in Slavonian oak barrels for three years and cellared in bottle for 6 months, this wine offers a warm, smooth finish. A wine which will reward extensive cellaring. Classic Sangiovese aromas of violet, wild berry, baking spice and a whiff of new leather meld together on this. The structured full-bodied palate delivers black cherry, crushed raspberry, clove and star anise set against firm acidity and a backbone of tightly wound tannins that grip the finish. Drink 2023–2033. A fleshy style whose richness offsets the leafy tannins, paving the way for cherry, almond, leather and iron notes. Finishes dry, with length and grip. There’s plenty of elegance here, from the light touches of flowers to the red berry and stone flavors to the vivid acidity. This hangs together, with the structure driving the long finish. Best from 2020 though 2036. Scorched earth, cured meat, toasted nut and grilled herb aromas lead the nose on this full-bodied red . The warm, ripe palate doles out raspberry jam, mature black cherry, vanilla and star anise framed In firm, velvety tannins. A beefy, tannic style, with submerged cherry and plum flavors, accented by spice and leather notes. The fruit core extends through the finish. Aromas of basil, juniper, rosemary and wet earth combine with sweet berry flavors and a smooth profile in this powerful red. …lingers with spice and briar elements. Drink now through 2024. A study in balance, this wine has dark berry and tobacco aromas that are elegant rather than overly intense. The palate reveals polished tannins and firm fruit flavors. Appealing floral, cedar, spice and black cherry aromas lead to cherry and raspberry flavors in this fresh red, which is balanced and firm, with a long finish. Best from 2015 through 2028. Very perfumed and silky for the vintage, featuring rose, truffle, leather and macerated cherry. Harmonious yet structured, with firm tannins exerting themselves on the finish, ending with a spice and tobacco aftertaste. Best from 2014 through 2028.